This Prestashop Birthday Coupon Addon motivate your customers to revisit your store. This Prestashop Birthday Gift Addon make the customer special day even more special by offering them gift vouchers. 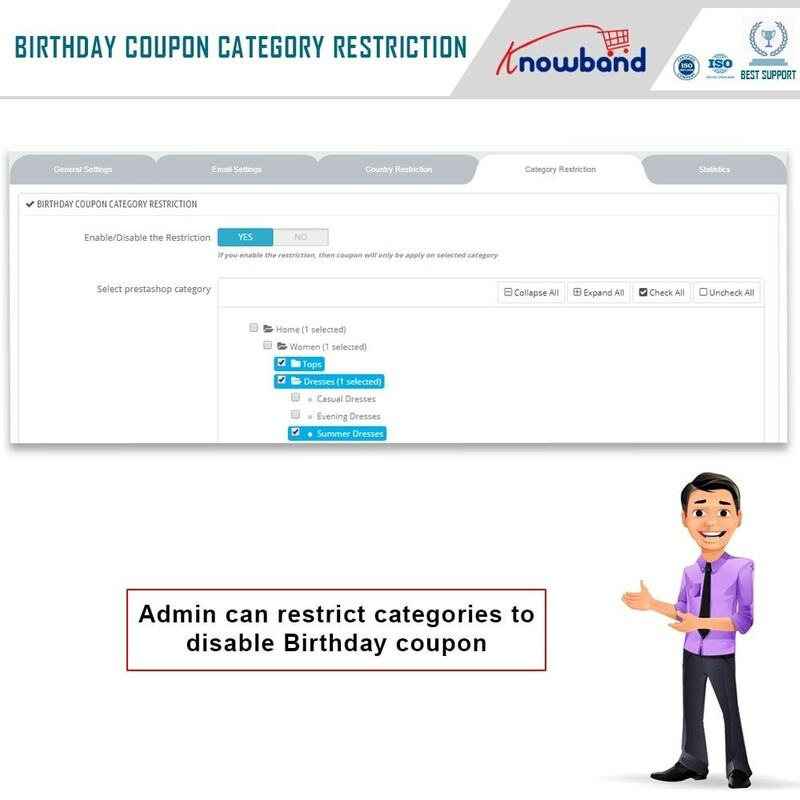 This Prestashop Birthday Coupon Addon allows the online shoppers to personalized birthday Emails or appreciation for completing a year of account creation of the customers is a strong way to engage them. Triggering email with wishes coupled with alluring incentives at relevant moments can ensure customer loyalty. 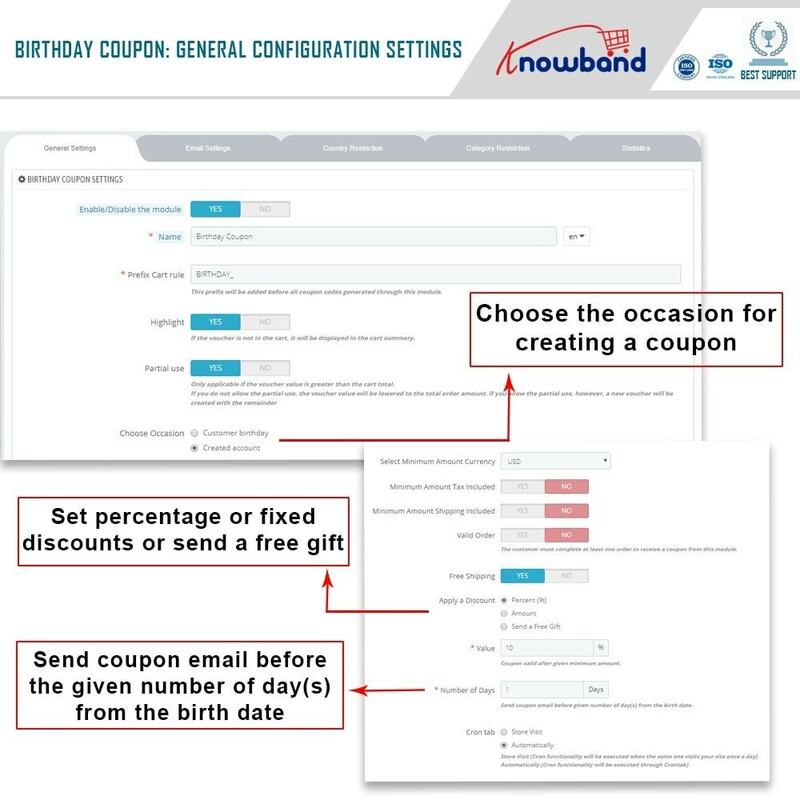 Prestashop birthday coupon module can help you create the much-required personal connection with your registered customers. 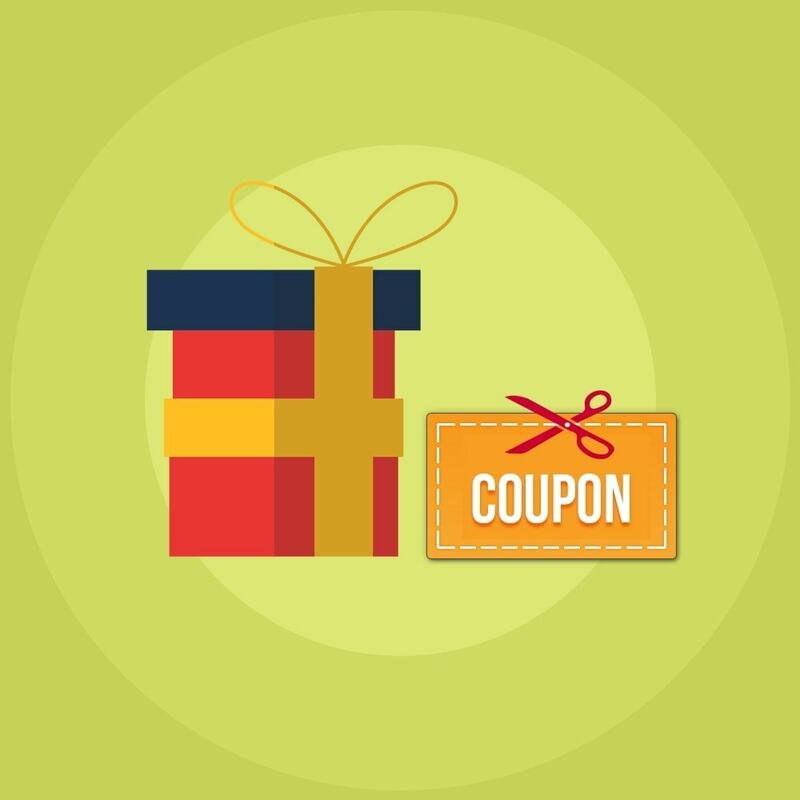 The powerful marketing tool allows the e-merchants to send wishes via emails coupons. The customers can enter the coupon code in order to get their presents which may be a discount amount or a free gift. The Prestashop Addon allows the merchants to create a personal connection with the customers. This Prestashop Birthday Vouchers extension makes it easier for them to send the personalized emails to the customers individually. These coupons and offers compel the customer to return back to the store. The store admin can even set the minimum cart value at which the discount will be applicable. Thus, this Prestashop addon will motivate the customers to add more product to their cart. The Online merchant can set the coupon validity(In days). This Prestashop addon allows the Prestashop store admin to set the minimum amount of the order beyond this limit customer won’t use this coupon. The Admin can allow the free shipping to the customer according to the need. 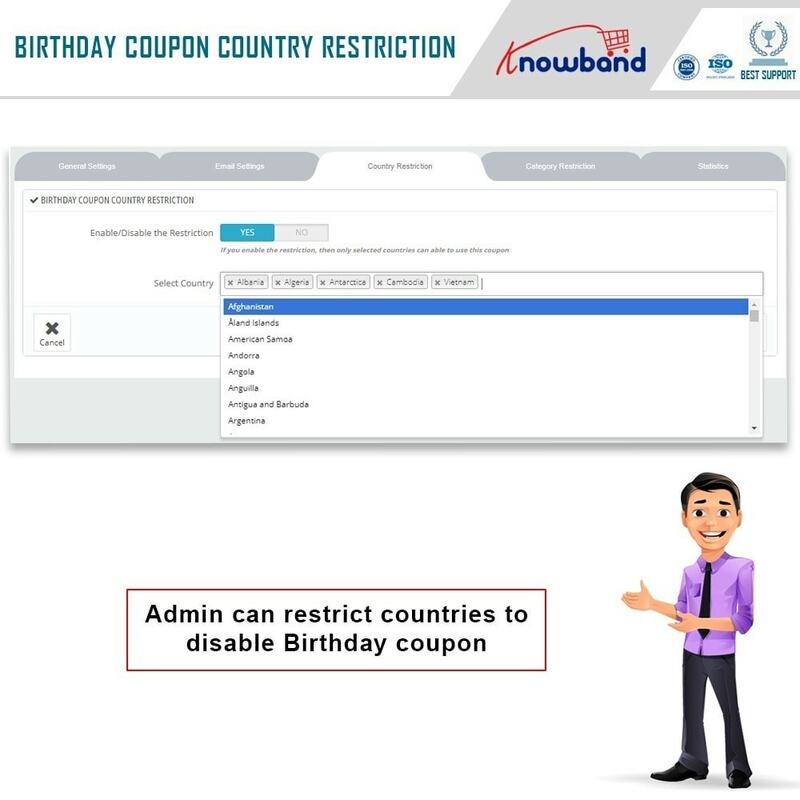 The Prestashop Birthday Coupon addon gives the freedom to admin to apply the discount like percentage, amount and sends a free gift. The Store Admin can set the birthday coupon validity in days. The store admin to set the cron settings. The multi-lingual support allows the admin to send the email triggers in multiple languages. The addon is multi-store and SSL compatible. The Prestashop Birthday Coupon module allows the admin to send wishes to the customers on two occasions: On their birthdays’ and ‘On the first anniversary of the account creation’. The customers will either get a fixed discount amount, discount percentage or any free product. In case of discounts, the admin can allow the customers to use it partially. The coupons offered can be customized by the store owner. The text to be displayed in the cart summary and invoice can be fixed in multiple languages. 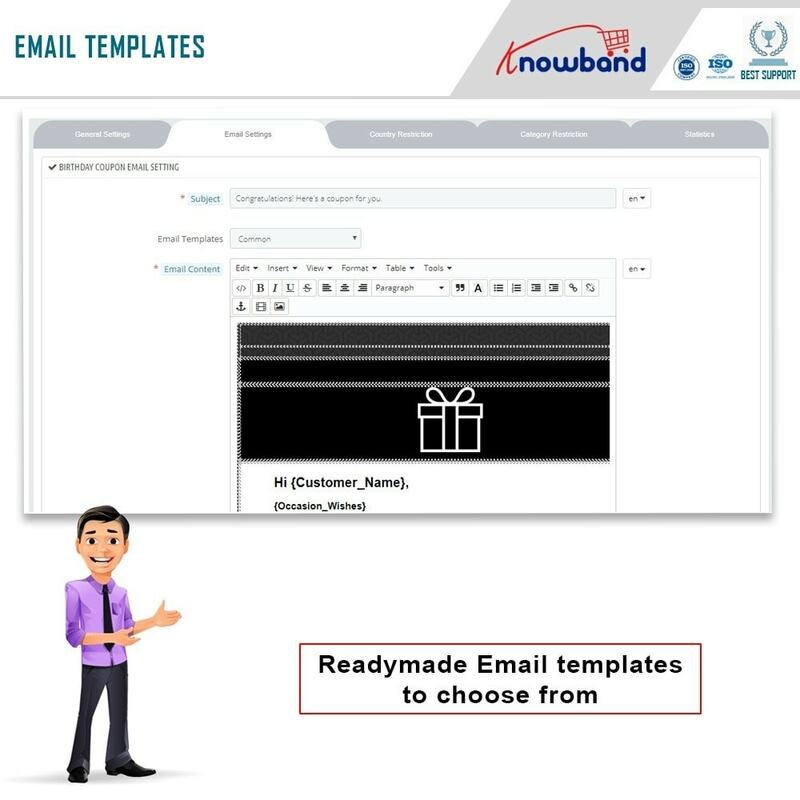 The e-merchants get to choose from the default email templates. This Prestashop Birthday Presents Addon allows admin to send the wishes by just selecting the desired template. The emails can be tested before they are sent to the end-user. These offers can be enabled in all the countries in which the store is operating. The store admin can exclude a country, the admin can enable the restriction and select the country in which he wants to provide the offer. The admin can even select the category for which he is looking to provide the offer. In case the restriction is disabled, the discounts will be applicable in all the categories of the site. Prestashop Birthday present module provides a statistical report of all the coupons that were generated along with their status. The personalized message will definitely get the appreciation of the customers. The discounts offered will help them shop even more. There are chances of getting free gifts as well.